Volvo has suddenly become active in the Indian market. Since the XC90 launched in the Indian market, it has gained a lot of attention due to it being huge, good looking and having a lot of technology as well. Today, the company has launched the flagship variant of the massive SUV, the XC90 T8 Hybrid priced at Rs 1.25 crores ex showroom Delhi. Why is this the future of Indian cars? A small turbo petrol with a hybrid system is what the future looks like. Putting in a smaller engine helps to keep emissions low and helps to make the car highly fuel efficient. But that alone makes the car boring. Adding an electric power source can certainly liven up the feel and add a lot of power. Also, since the electric power can be supplied at as low as 0 rpm, it makes up for the turbolag which would have been felt otherwise. This is exactly what Volvo has done with the hybrid XC90 T8. So, you get 407 Bhp and 57 Kmpl. In future expect most cars sold in India to feature a turbo petrol hybrid powertrain. What’s new on this variant of the XC90? Currently, Volvo only offers the 2.0 liter diesel engine option on the XC90 which is not very sporty or powerful. To take care of that, Volvo has launched the T8 petrol variant in the country today. Though the T8 may sound like it has a larger engine, but it too is powered by a 2.0 liter turbo petrol engine. So what’s the fuss about? Well this 2.0 liter engine is assisted by an electric motor and is a Plug-in hybrid. So what does that mean? Well combined, the output is a massive 407 Bhp and 640 Nm. It thus becomes the most powerful hybrid to go on sale in the country. Keep in mind that the sporty BMW i8 only has 362 Bhp and 570 Nm. Not only that, Volvo claims that the combined fuel economy for the XC90 is a massive 57. kmpl (134.5 mpg), which is even more than that on the i8. Currently the most fuel efficient SUV in India is the Vitara Brezza at 24.3 kmpl. The XC90 T8 will be India’s first plug-in hybrid. It comes with 3 driving modes, Pure, Hybrid and Power. In pure mode, the vehicle will drive in all electric mode and if the battery is fully charged, it can run 40 kms on full battery mode. In hybrid mode, the vehicle decides which power unit to use depending upon throttle input and terrain. In power mode, the whole 407 Bhp is on offer. The vehicle is no slouch either and does 0-100 in 5.6 seconds. 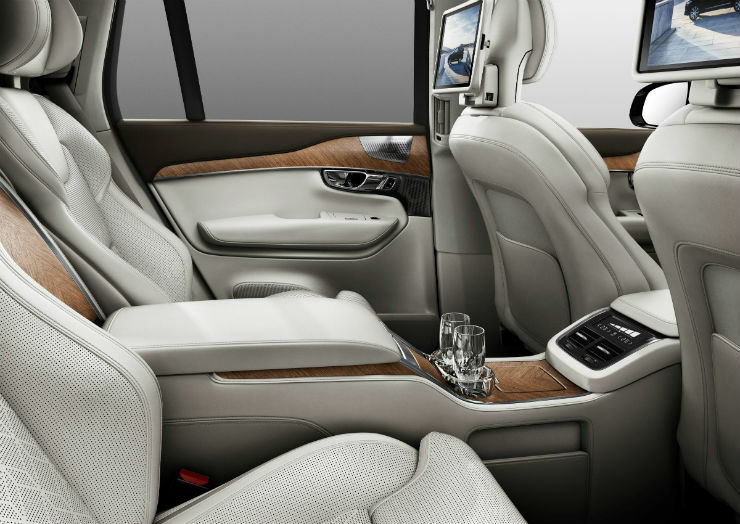 On the inside, the XC90 will only come in the Excellence trim which means it will only be offered with 4 seats instead of the 5 or 7 seat configuration offered on the normal XC90. 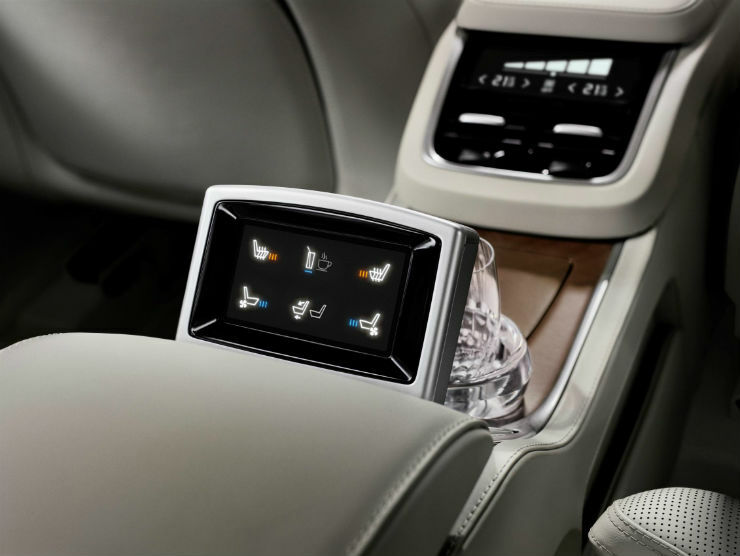 These seats are individual ones and can be reclined, offer massage function as well as ventilation. These can be operated via a pop up touch screen unit which is placed between the two seats. Also on offer is the business class like tray tables which can be folded into the armrest. The arm rest has storage area as well as USB points for charging. There is also an in-car refrigerator with a set of exclusive crystal glasses and champagne flute holders so that your bottles are always safe. Up front, the same large touch screen system and uncluttered dashboard is carried forward from the normal XC90. Also on offer will be the 1400 W Bowers & Wilkins 19 speaker sound system.